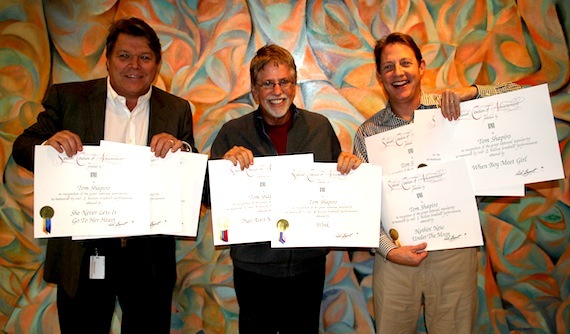 BMI recently presented Tom Shapiro with Million-Air Awards for five of his songs at its Music Row office. One of Nashville’s most successful songwriters, Shapiro received Million-Air Awards for “She Never Lets it Go to Her Heart,” recorded by Tim McGraw (2 million performances); “That Ain’t My Truck,” recorded by Rhett Akins (3 million performances); “Wink,” recorded by Neal McCoy (4 million performances); “Nothin’ New Under the Moon,” recorded by LeAnn Rimes (1 million performances); and “When Boy Meets Girl,” recorded by Terri Clark (2 million performances). Shapiro is a four-time BMI Country Songwriter of the Year and has penned 23 No. 1 hits.